Found at a McDonald’s stairway in China. Ask yourself: Do you know these stairs? Be sure to taste our McNuggets while going down. A service bought to you by the Hotel BJ. My lord, how many times have I heard women saying THIS ! 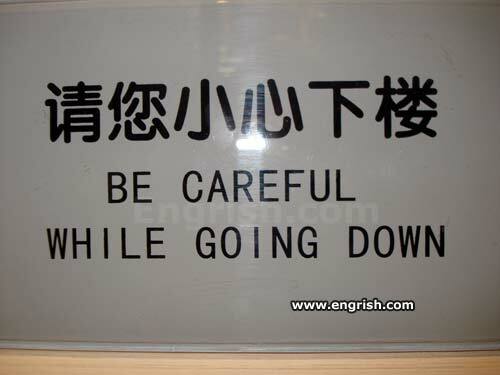 Be careful while reading this sign. Furburgers just 99 yen. Limited time only. I wonder how many people have fallen down the stairs by looking at this sign instead of their feet. It helps if other people know you’re coming. Being able to breathe through your ears would be useful. By the time you read this sign, it’s gonna be too late. Caution: Going Down may result in Coming Up. If you choose to come, bring a rag. How about when I am up and coming? ….Ronald didn’t wash too well this morning. I don’t really understand what’s funny or incorrect about this. I’m wondering if I’m missing something.